Propworx sold dozens of Kat-related props earlier this year, including two very similar sets of boxing gear from “Unfinished Business”. One of those two sets went to France! We know this because French fan Audrey and her friends had the great idea to make store display of all the props and costumes they bought from the Battlestar auctions. And what an amazing display it is! This is what makes a fanboy’s heart flutter. You can see the photo of Kat’s boxing gear here in their gallery. 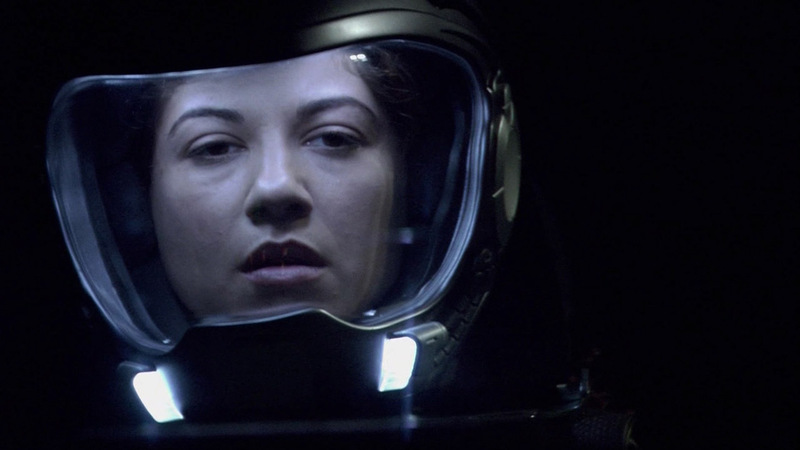 Luciana Carro as Kat in BSG 2.13 "Epiphanies"
Meanwhile, Kat’s helmet was not among the props auctioned by Propworx. But guess who has it? Katee Sackhoff! As you may know, Katee answers fan questions on a regular basis (“Ask Katee“). When a fan asked her whether she was able to get any Starbuck props, Katee revealed that she’s still trying to get her helmet. They sent her Kat’s helmet, but she doesn’t want that one, of course. You can listen to that comment here. This entry was posted in Other and tagged Battlestar Galactica, Kat, Katee Sackhoff, Louanne Katraine, Props. Bookmark the permalink. 4 Responses to Who has Kat's helmet and boxing gear? Katee Sackhoff has Kat’s helmet. She says that in one of the Q & A’s on her website, kateesackhoff.com. I just can’t remeber which edition. It isn’t, at least it’s not at the moment. Apparently, Katee hasn’t decided yet what she’s going to do with the helmet. She may trade in the helmet for some other prop. Or, she may auction it off. If that happens, we’ll announce it here at the blog, of course.